The origin of this meal is from the Moro Cookbook, which is not only one of my favourite cookbooks but wriiten by the chefs at a restaurant I love dearly. I love the fact that I can get genuine Spanish food cooked with passion without having to wade though depressing lists of tapas and then get ripped off for the pleasure. UK tapas restaurants are uniquely distressing places, they take all the good parts of the experience of eating tapas in Spain, throw them out of the window and leave you eating greasy patatas bravas whilst listening to the Gypsy Kings (shudder). Thankfully a few have cropped up over the years including the rather good Fino. Anyway this is a complete bastardisation of a dish I've made to good effect a fair few times, Seared Sirloin Salad with barley and sumac. This bears little or no resemblance to that fine dish. Instead of the barley I've used toasted pine nuts (pressed for time I had no time to soak pearl barley). The sirloin is marinated with a pinch of allspice, black pepper, chopped shallots and red wine vinegar then seared very quickly over a ferocious heat. The salad is some mixed baby leaf (whatever's knocking about), a good fat handful of flat parsley, the pine nuts, muscatel or similar white grapes and dressed with a garlic clove turned to paste mixed with sea salt, red wine vinegar and olive oil. 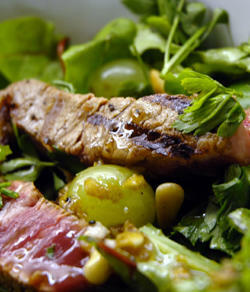 It's a lovely combination of flavours, the toasted nuts and grapes setting off the meat beautifully. MG: You know why they play Gypsy Kings in restaurants? Really loud? So you'll leave! They usually crank 'em up when the kitchen wants to close down. Your dish looks wonderful. I thought those were green olives; no, grapes. Dreamy. I hate the way they do tapas here too. It is so different from the real thing. My first proper tapas experience was in Pamplona. We'd visited two bars before someone told us about the smaller glasses! The only time I've ever been given tapas free was in a bar opposite the cathederal in Leon, and yet I constantly hear how they are free with your drink in Spain. Barbara: Pamplona is pretty good, though Bilbao and San Sebastian rule the roost in terms of tapas in my book. I've had freebie tapas in Santiago and in Granada and once or twice in Madrid, they doesn't seem to be any rhyme or reason to it. I thought I would let you know that I like your blog a lot and am linking to it. I thought I would let you know that I like your blog a lot and am linking to it. Love the use of sumac in this recipe. There's a great restaurant in SLC that has it on the tables to sprinkle on your kabobs, but I have not used it much at home yet. Well as you can see, I was interrupted by a phone call and then published the comment twice (better the second time) Luckily I am "old" by blogging standards so when I'm feeble minded I can blame it on that.